Smartwatch shipments declined by 51.6% year-on-year, according to a new report by market analysts IDC. The Apple Watch remained the market leader but it shipped just over one million units in the third quarter of 2016 (July - September). During the same period in 2015, it shipped 3.9 million. Of the five leading brands, only Garmin showed growth but its figures remained low. However, this was a period before new versions were released, experts said. Nonetheless, it still suggests that consumer appetite is weak, said Jitesh Ubrani from IDC. 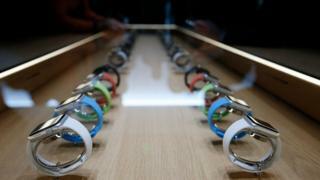 "It has become evident that, at present, smartwatches are not for everyone," he said. "Having a clear purpose and use case is paramount, hence many vendors are focusing on fitness due to its simplicity." Apple has positioned its latest version of the Watch as a fitness device rather than a luxury fashion accessory - it discontinued the gold edition of its original wearable, which retailed at $10,000 (£8,000), last month. The new version can track swimming activity and a special edition, in partnership with fitness giant Nike, is due to go on sale on Friday, 28 October. "This latest quarter is not a true representation of what is happening with wearables," said industry analyst Ben Wood from CCS Insight. "The new Apple Watch was looming, Samsung has announced new products that are not shipping yet and Google has delayed the next release of Android Wear." IDC looked only at smartwatch brands which run third-party apps in its market report. The tech giants face big competition from traditional watchmakers, Ben Wood believes. "We actually believe the growing number of so-called smart analogue watches are where the main action will be in 2017, particularly as well-established watch brands like Fossil increase the number of smarter models they offer though traditional watch retail channels," he said.